In this tutorial we are going to look how to change the design of your charts so that it will show the data in the way that you want it to. 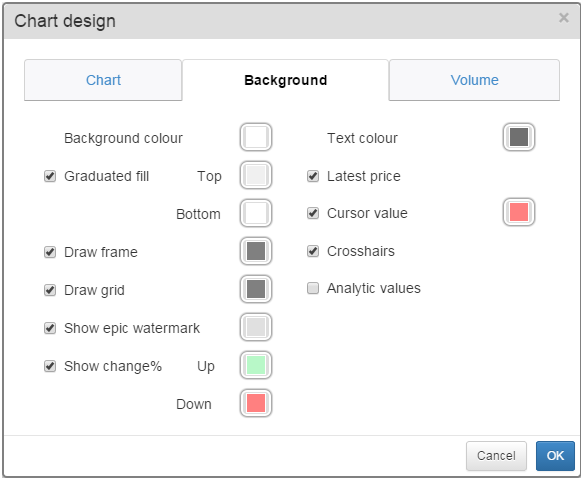 For information about how to create new chart settings please have a look at the SharePad Chart Settings tutorial. 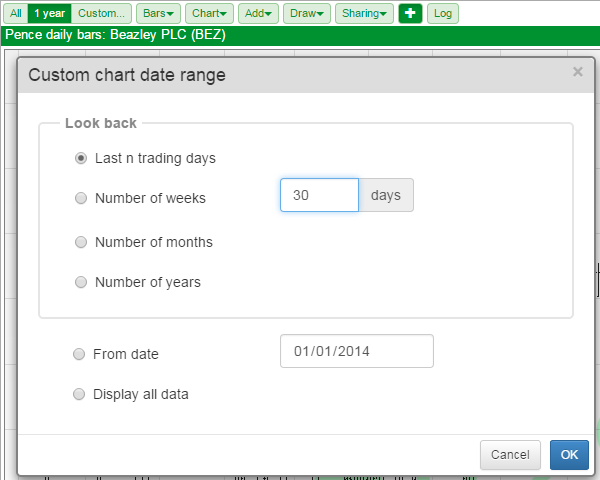 The default chart that is displayed when you create a new chart setting is set to show a 1 year chart with daily bars. You can see what range and bar size a chart is set to by looking at the top left of the chart screen. The first three buttons on the toolbar relate to the range shown on the chart. Here you can see 1 year is highlighted in dark green. 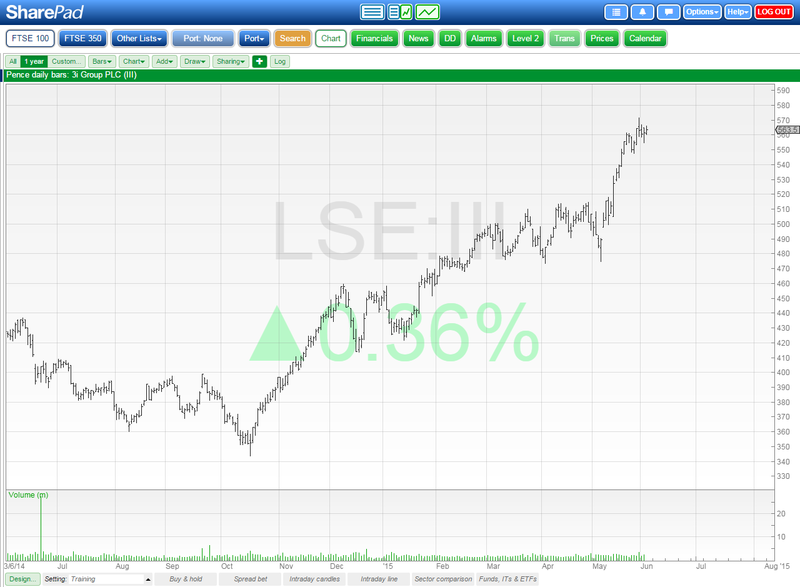 Below that on the title of the graph you can see: Pence daily bars: 3i Group PLC (III). This tells you the size of the bars being displayed on the chart. To change the date range you can select the All option, which will show all of the data we have for the selected security. You can select whatever is shown on the second button, in this case 1 year. Or you can select the Custom... button which will open a dialog that allows you to set your preferred range. Once you have set your options the button to the right of the All button will change to reflect this. In this example we have set the range to be 6 months. You can see that the second button on the toolbar now reflects this. To change the size of the bars shown on the chart you click on the Bars button and select the new bar size from the drop down list. You can see on the title of the chart that the bar size is now weekly. Many aspects of the chart can be changed by selected the Design... button which is located in the bottom left-hand corner of the chart. You can see that there are three tabs on the Chart design dialog window; Chart, Background and Volume. Show Future - this determines how much blank space is shown on the chart between the latest candle and the right hand axis. Left hand axis & Right hand axis - these allow you to change both axes so that they show either percentage or price values or they are turned off. When Close/Close or Close/Open are selected, up and down colours become available on the right hand side of the dialog screen. 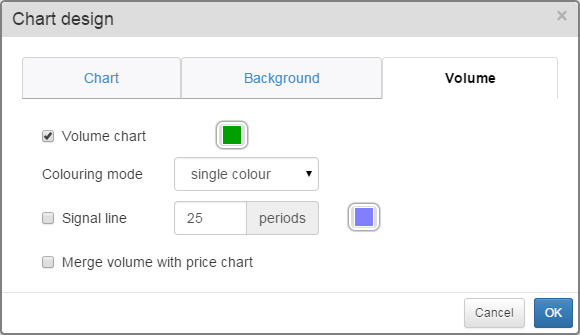 Note: Colouring mode is only available when OHLC Bars, Candlesticks or Heikin-Ashi are selected as the Main chart type. Bid/Offer line - this draws lines on the chart that show the share's Bid and Offer. The area between the two lines represents the Spread. 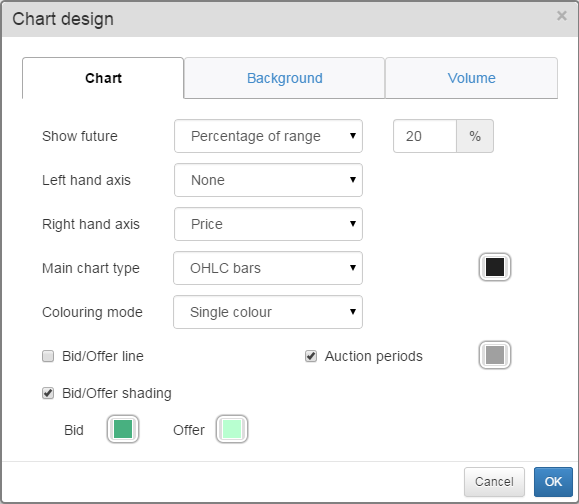 Bid/Offer shading - this shades the area above and below the Offer and the Bid on the chart. The offer will shade the upper portion of the chart and the Bid will shade the lower portion of the chart. As with the Bid/Offer line the area between the two coloured sections on the chart is the spread. Auction periods - this shows a bar on the chart from the top of the chart to the Y axis for any period where a share has been placed in an unscheduled auction. Note: Bid/Offer lines, Bid/Offer shading and Auction periods are only shown when the chart is set to show bars that are less than 1 day in size. Background colour - this determines the colour of the background of the chart and the area surrounding the axes. Graduated fill: Top & Bottom - This sets a graduated colour fill from the top to the bottom of the chart. Note: this overrides the Background colour for the chart, but only within the chart axes. Draw frame - this turns the frame around the chart on and off and determines its colour. Draw grid - this turns the grid on the chart on and off and also determines the colour of the lines. Show TIDM watermark - this shows the selected share's TIDM (EPIC) code on the background of the chart. 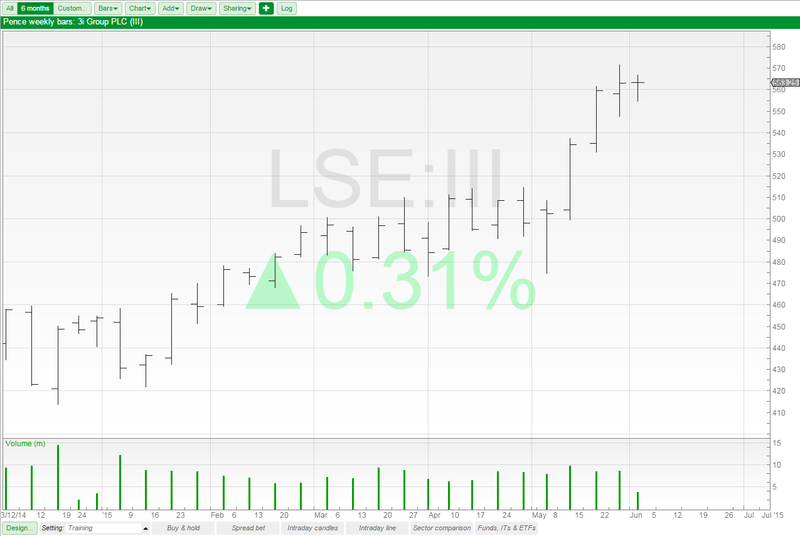 Show change%: Up & Down - this shows the % change in the share's current Mid(or Close) price from the previous Close as on the background of the chart. Text colour - changes the colour of the text on the axes of the chart. Latest Price - show the latest price for the instrument in the right hand margin. Cursor value - this shows the value of the cursor in the right hand margin and the date of the cursor above the Y-Axis at the bottom of the chart. The colour of the label used can also be set. Note: the date only appears when a bar size of 1 day or greater has been selected. Crosshairs - draws a horizontal and vertical line centred on the cursor. Note: the colour of the crosshair lines is set by the Draw frame colour option. Analytic values - shows the current value for any of the Moving Averages or Indicators in the right hand margin. 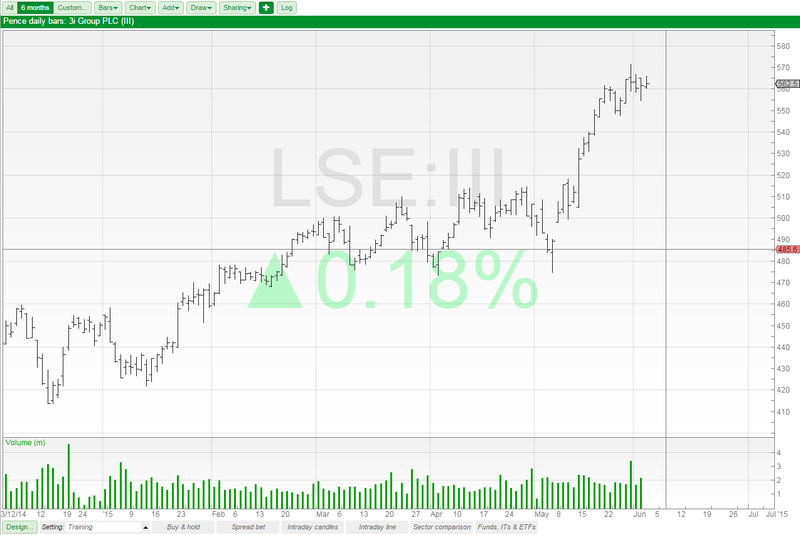 The label will be coloured with the same colour as the main line for the indicator or the moving average. Volume Chart - this turns the volume on and off and sets the colour of the volume chart. Note selecting any option other than Single colour will provide Positive and Negative colour options besides Volume chart. Signal line - Allows you to draw an exponential moving average of the volume. You can set the period and colour of the line that is drawn. 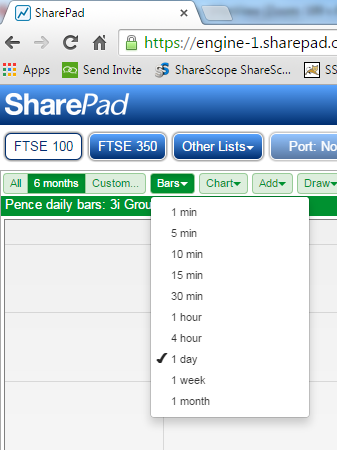 Merge volume with price chart - In SharePad, especially on smaller tablet screens, space can be of a premium. This option allows you to draw the volume over the bottom of the price chart. This then frees up space either for the chart or for an indicator. This is a 6 month chart showing daily candlesticks. The background has been given a pale blue/white shaded frame. The frame colour has been set to black. 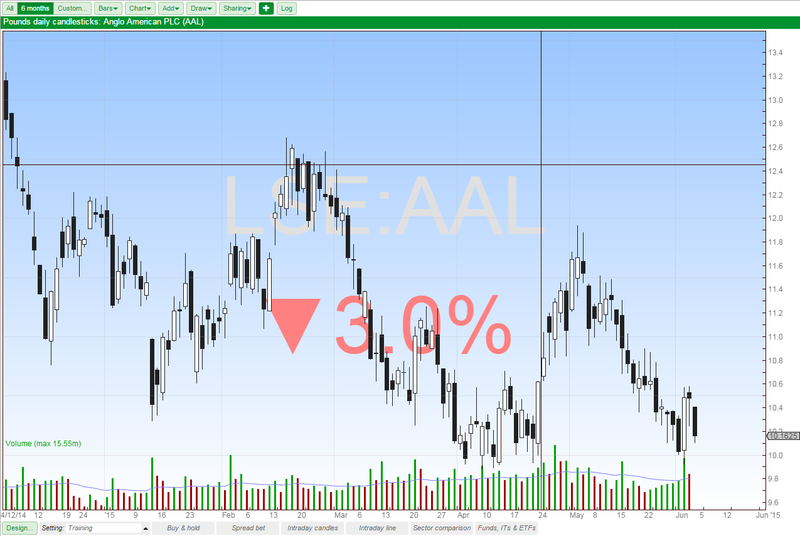 The volume has been merged with the chart and coloured by volume change. A blue signal line has been added to the volume as well.